This really isn’t a Mexican dish, but a recipe invention out of New Mexico. New Mexico uses a lot of traditional Mexican ingredients, but they make their own culinary inventions. Review an article that we posted with a blog guest who explained the difference between Mexican and Tex-Mex food, the information could also apply to Mexican Food verses New Mexico style Mexican Food…link here. 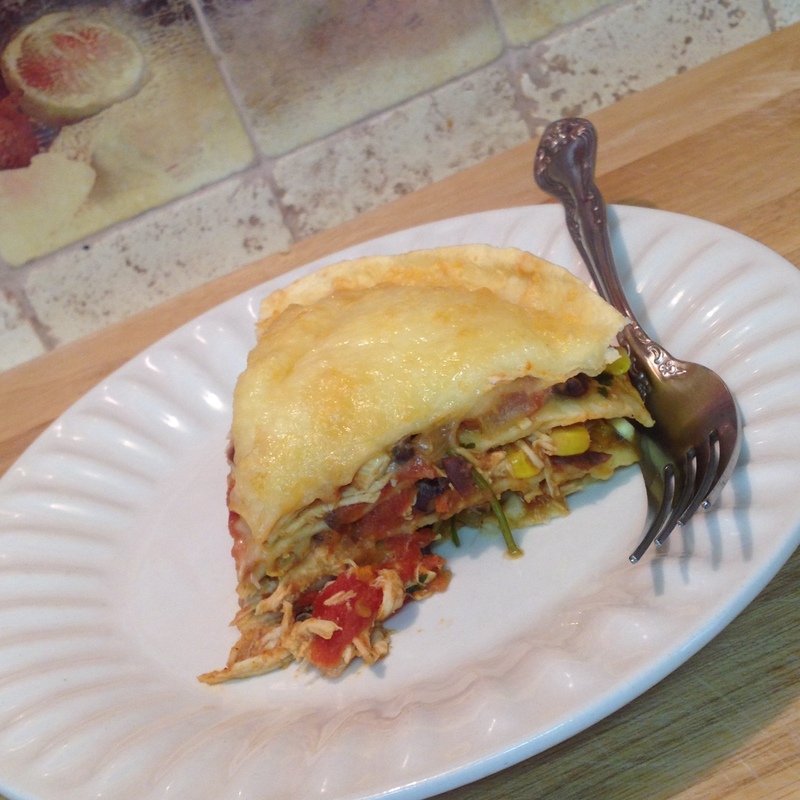 There are other similar recipes of Mexican Chicken Tortilla Pie, but they use ground beef and bake it in a cast iron skillet. For more on cooking with cast iron skillets view our articles here. 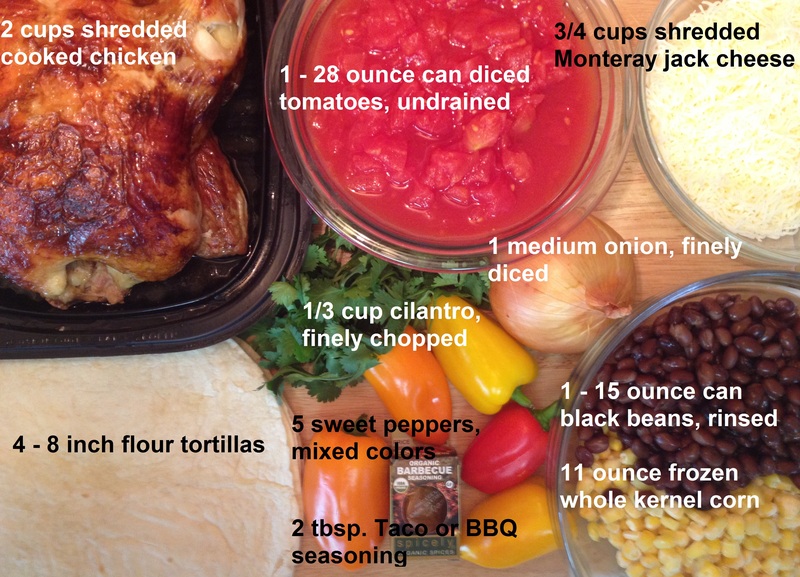 Now for our featured recipe Mexican Chicken Tortilla Pie, and here is what you will need. You can also use BBQ chicken breast shredded. I used BBQ seasoning in place of Taco seasoning as they both use similar herbs. Heat the oil in a large skillet over medium-high heat. Add the onion and sweet peppers and saute, stirring until they are tender. 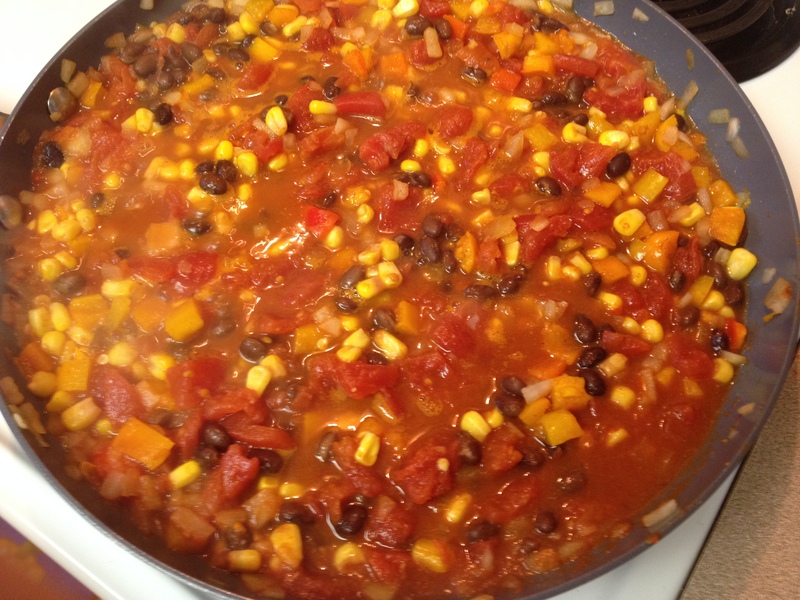 Then add the diced tomato, black beans, corn, and seasoning and mix together until well incorporated. Let simmer, uncovered for about 10 minutes. 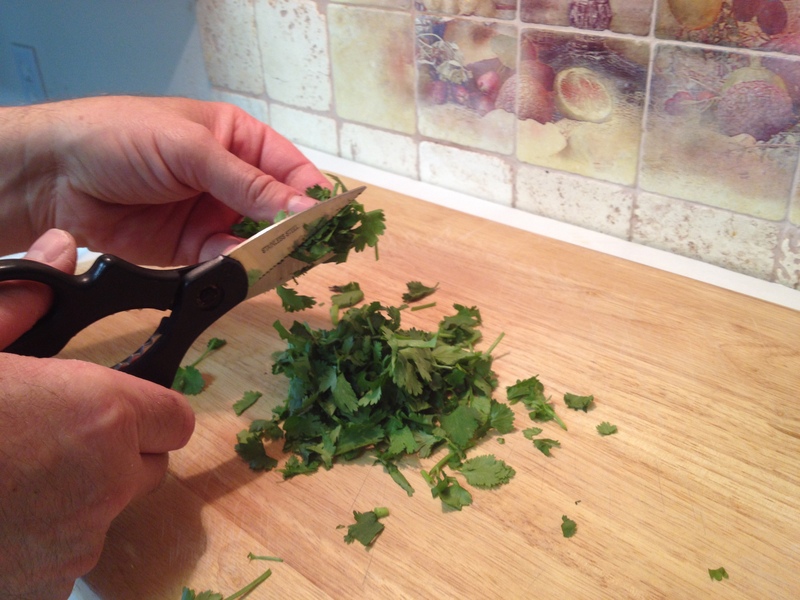 We use kitchen shears to cut the cilantro, making it easy and convenient. It is cut up just before use, never before. The oils that flow from the cut leaves start deteriorating after cutting into the leaves. For maximum flavor, prepare the herb just before you need it. 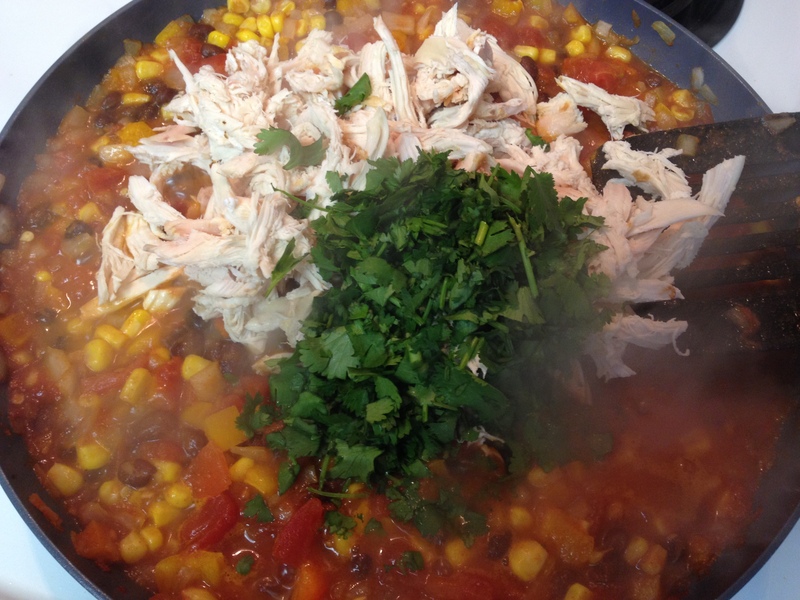 Now that the mixture has simmered for 10 minutes, add the shredded chicken and cut cilantro, and stir in and cook until hot. Now to prepare the pie, line the bottom and sides of an 8 inch spring-form pan. Position one tortilla on the bottom of the lined pan and spoon on mixture until if spreads even over the surface of the tortilla. Repeat this three more times, using the other three tortillas. After placing the last tortilla on the top, spread the cheese out over it. Place into the heated oven and bake for 20 minutes or until browned lightly. Remove and let stand 5 minutes. Remove the ring from the spring-form panas well as the paper around the pie, and slide pie onto a platter and serve. It may not be a Mexican original culinary dish, but for the sack of argument, let’s say it is. 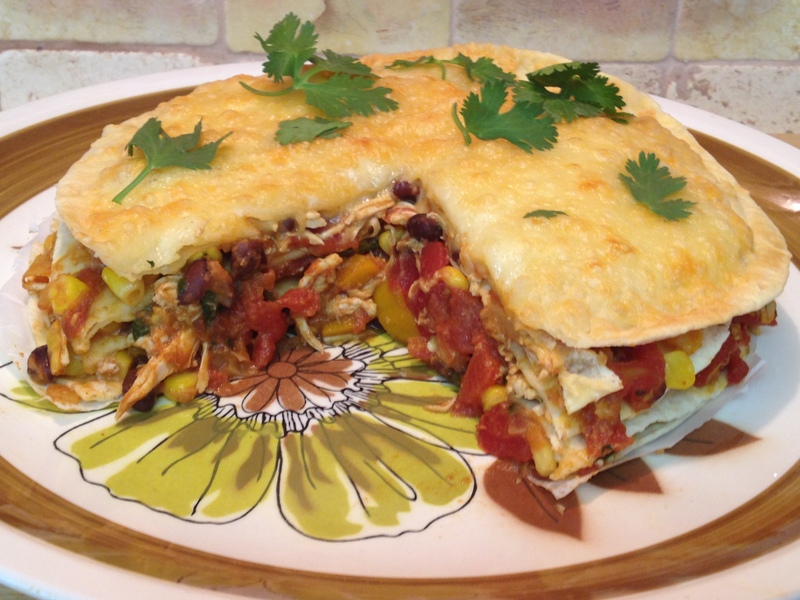 Enjoy your slice of Mexican Chicken Tortilla Pie. This entry was posted in Chicken, Main Dish, Party Favorites, Top 2014 Viewed Recipes and tagged Barbecue chicken, cast iron skillet, cast iron skillets, Chicken Enchiladas, Cook, Mexican Chicken Tortilla Pie, Mexican cuisine, Mexican dish, Mexican food, Monterey Jack, New Mexico, Taco, Tex-Mex, Tortilla. Bookmark the permalink. Hahaha looks good! Nice Mexican ingredients though!